We had a small party for Martha’s 6th birthday this year, as she had a big party for her 5th, and with her birthday so close to Christmas I felt we had enough to do. So with numbers limited to six of her closest school friends, we made a plan to amuse them in our house. 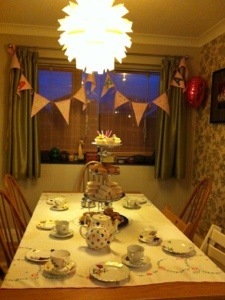 So I came up with the idea of a cupcake/afternoon tea party. I made them a quick half apron each (out of a charity shop double duvet set) and they each had a little rolling pin (90p each from Wilkos) laid out on the dining table, so that we would all decorate a pre-made cupcake (or two) with pre-made buttercream, smarties, jelly tots and I showed them how to make simple roses with moulding icing. A liberal sprinkling of cake glitter and their cakes were done, one for the tea party and one to take home. 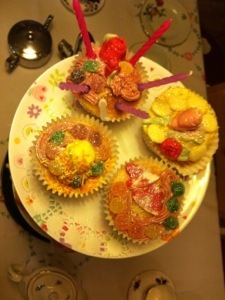 I was surprised how much of the icing and sweets actually made if onto the cakes and were left over! Then the girls played the required game of pass the parcel, while I cleaned up a bit and set the table for kid friendly afternoon tea. I made cheese staws and tomato pesto wheels, with half z pack off ready made puff pastry, and cheese, ham and tuna finger sandwiches, scones with homemade stawberry jam and clotted cream and arranged them all, along with the wonderful cupcakes on a cake stand. I dipped into my collection of vintage (charity shop) tea sets for some floral patterned cups and saucers and cake plates and filled the teapots with pink milk and pink lemonade. We put candles in Martha’s cupcake to sing ‘happy birthday’ to. A few more games of musical cushions and statues, and it was hometime. I think it was very successful, the girls all seemed to enjoy themselves, the whole think didn’t break the bank and they made some fabulous cakes! I promptly downloaded the picture took it into photoshop, resized it and made an A4 page with 8 angels on it, and printed 5 of these onto some gloss photo paper I had knocking about. I sat and cut out all the angels and cut the frilly bits off the edges of the doilies and then cut into triangles. Then I filled a beaker with PVA glue and got the kids. I painted a rough star shape onto the card with glue and the kids stuck the triangles onto it to make star shape and then stuck the angel picture into the middle. Then we painted the glitter onto the angel picture, which was certainly the girls’ favorite bit. Some are of course better than others, but I quite like that they are all a bit different. They certainly look homemade which is the whole point. We only have one that opens backwards this year!